Sorry for the slow posting this week! We’ve been pretty busy with school activities and homework, but hopefully next week we will be able to post more consistently. Since fall begins Sunday, we decided to share an ideal breakfast treat for you to make Sunday morning. We’ve made pumpkin muffins before (many, many times) and usually just add in chocolate chips, but we decided to try something different this year. 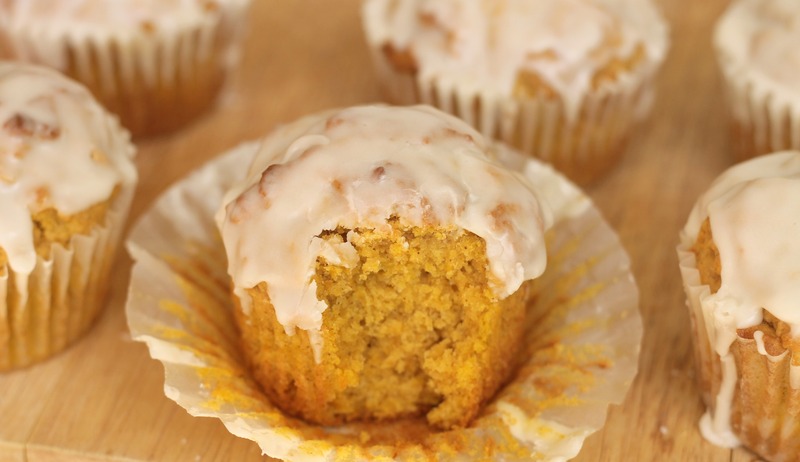 When we came across a recipe for pumpkin doughnut muffins, we knew we had found a good recipe. These muffins are really only reminiscent of doughnuts in that they have a nice, thick glaze and a tender cake-doughnut sort of center. Regardless, they are heavenly! They have just the right amount of spice and are moist and soft, but with a slightly crunchy top. The best part is that they are very simple to make. Whether you make them to serve as breakfast or dessert, we think that whoever tries one will be enamored. Our family certainly was! We have been having fun baking for fall, so there will be more pumpkin recipes to come in the next several weeks. Preheat your oven to 400 degrees. Whisk together flour, baking powder, baking soda, salt, cinnamon, nutmeg, ginger and cloves in a medium bowl. In a separate small bowl, whisk together pumpkin puree and sour cream. With an electric mixer, cream butter, 1 tablespoon vegetable oil, brown sugar and granulated sugar on medium-high speed for three-four minutes until pale and fluffy. Beat in vanilla. Blend in remaining 3 tablespoons vegetable oil. Mix in eggs one at a time, beating just until combined after each addition. Using a spatula and working in three separate batches, add the flour mixture in 3 additions, beginning and ending with flour mixture, alternating with half of the pumpkin mixture and fold together just until combined after each addition. Do not overmix. The batter will be thick. Divide batter among 12 muffin cups, sprayed or lined with muffin liners, filling each cup almost full. Bake in the preheated oven for 17 – 20 minutes until a toothpick inserted into center comes out mostly clean with maybe just a few moist crumbs. Allow the cooked muffins to rest several minutes in tin then transfer to a wire rack to cool. In a small mixing bowl, whisk together powdered sugar, milk and vanilla until smooth. Dip tops of nearly cool muffins into glaze and allow excess to run off. Return the muffins to the wire rack and allow the glaze to set. The muffins are best served the day that they are made. Enjoy! 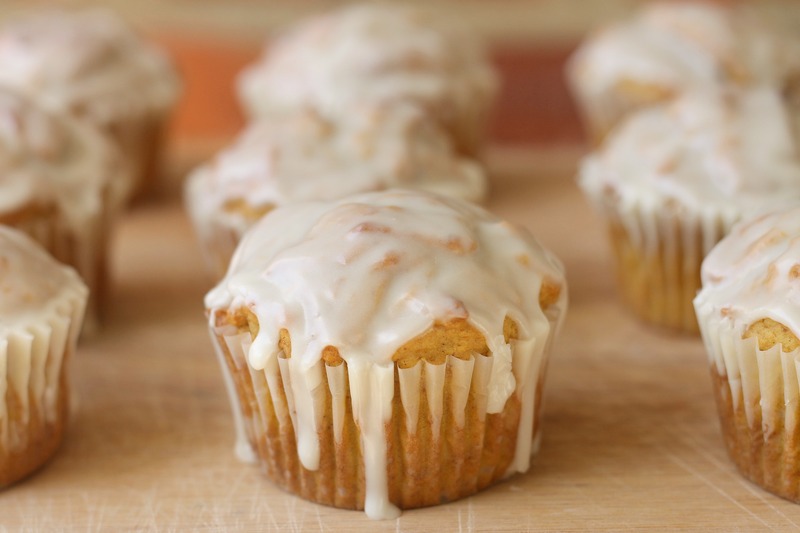 Yum – so happy it’s pumpkin season! So am I! Pumpkin treats are my favorite! Hi Girls! What a fun blog you have over here! Just updated my post with the original image reference–sorry about that; the image didn’t have your website when I found the image on Pinterest. 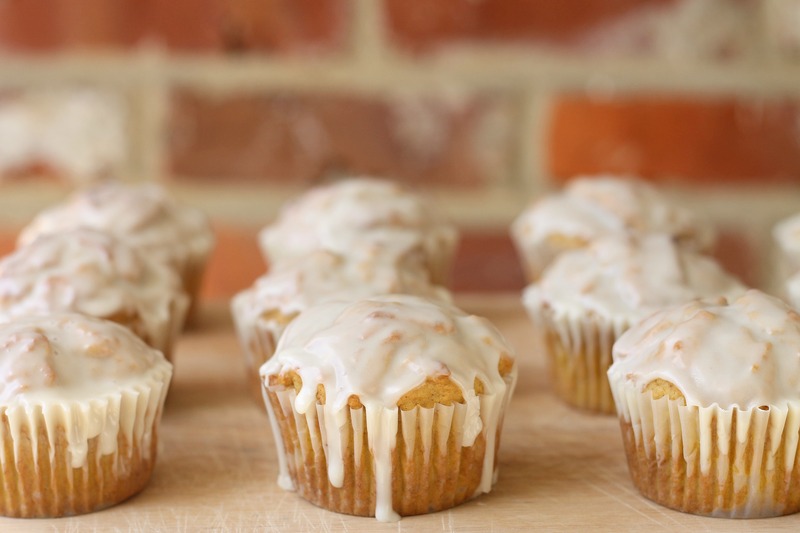 Glad to finally have the recipe for these donut muffins–thank you!! No problem! Sorry to be a pain- unfortunately, we had just found out about someone taking another picture of ours and adding their own watermark to it, so we were being a little cautious. I know it can be hard to find links on Pinterest! Thank you!